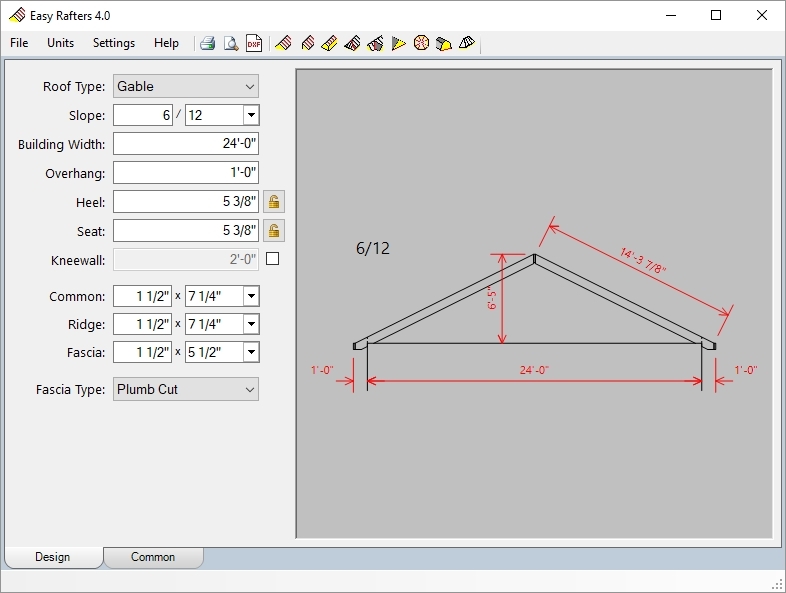 Easy Rafters is a standalone computer aided design program that takes the guesswork out of calculating and cutting roof rafters. Simply select a roof type, enter the required dimensions, and instantly generate fully dimensioned drawings that can be viewed onscreen, printed to any Windows printer, or exported as a DXF file. If you're a building professional, Easy Rafters will save you time & money by performing complex calculations quickly and accurately, by helping you accurately estimate materials and reduce waste, and by allowing you to use less experienced help when cutting rafters. Easy Rafter's DXF export capability allows architects and engineers to provide added value for their customers by including detailed rafter drawings and specifications with their plans. Works in Metric too! Calculates Gables, Sheds, Saltboxes, Hips (Regular and Irregular), Valleys, Blind Valleys, Polygons, Gambrels and Bay Window Roofs. Version 4.05 with File Save and File Open is now available! The Demo version is fully functional except that the building widths/roof spans are set to predetermined values and cannot be changed. This will allow you to fully explore the capabilities of Easy Rafters and determine if it meets your needs. The Unlimited License is suitable for professionals or others that have an ongoing need for Easy Rafters. The Unlimited License allows activation on two computers for your own use and does not require an internet connection after activation. The 30 Day Subscription License is a lower cost option for those with a short term need for Easy Rafters such as homeowners, diy'ers, etc. A full time internet connection is required for the 30 Day Subscription License. Registered users of previous versions can upgrade to Version 4.0 Unlimited at a discounted price. Please send an email with your name and address to request your upgrade code.